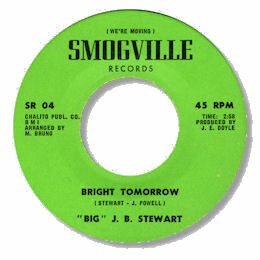 Like his stablemate Billy Love, Big J B Stewart only had just the one 45 on the West Coast Smogville label. By far the better side is Bright Tomorrow on which Stewart does a good job in getting the song across. I particularly like the big brassy horn chart - so reminiscent of the sort of arrangement that Joe Scott laid down for Bobby Bland. Which is a very strong recommendation.